I remember when I first fell in love with tea. I was a little girl sitting at my mother’s kitchen table, sipping a cup of English Breakfast Tea with a liberal amount of cream and sugar. It wasn’t a tea party per se but the memory of that blissful concoction stayed with me through the years until I had daughters of my own. Girlhood and teatime just seem to go together don’t they? Serving tea to family and friends has become second nature for me and my daughters. Taking time out of our busy schedules to minister this lovely repast is a “soul satisfying” experience. 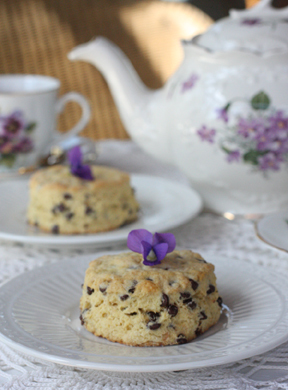 We especially enjoy blessing others with a strong pot of English Breakfast Tea–cream and sugar of course–and mini-chocolate chip scones topped with raspberry jam – such a heavenly blend of flavors. Over the years, I have come to learn that the act of “taking tea” is synonymous with spiritual renewal. You can visibly see the stress drain from a weary one’s face when you offer a cup of fragrant tea. Heart-felt conversation comes more naturally when two or more are happily sipping from their favorite teacup or sampling a delicious finger sandwich or scone. Many a word of encouragement can be shared in this relaxed and inviting atmosphere. The tea table doesn’t have to be overly fancy or elegant, but acquiring new accessories can be a source of pleasure for all who gather round. Teacups, teapots, creamers, sugars bowls, teaspoons, napkins, and tablecloths can all be purchased for modest prices from antique stores or yard sales. Eclectic collections are just as esthetically pleasing as matched sets. There is an antique mall in our town called Twice as Nice. The girls and I love perusing the different vendor’s booths for tea related items. One day we happened upon eight tiny gold teaspoons to add to our collection. They are so delicate and add such a lovely touch to our teatime celebrations. It’s hard for a guest not to feel special when using such teatime finery. I think that’s why ladies, young and old, find teatime so special. It ministers to the feminine soul. Instituting a weekly teatime ritual is a wonderful way to enrich your children’s lives (don’t forget, boys like teatime, too). We love to sip tea and read aloud excerpts from The Girlhood Home Companion or listen to the monthly audio conversations from The Mother~Daughter Tea Cozy Club. Some of our most treasured memories are the lessons we’ve gleaned from other Christians as shared in the pages of these precious publications. Hearts are more receptive when the pace of life is slowed and everyone can relax and enjoy one another. Our passion for teatime has “spilled over” into the lives of our customers as well. Recently a mother shared with me how her young daughters were inspired to don aprons and serve tea for the first time because of the variety of recipes featured in The Girlhood Home Companion and The Mother~Daughter Tea Cozy Club. It makes us so happy to see other families begin teatime traditions of their own! 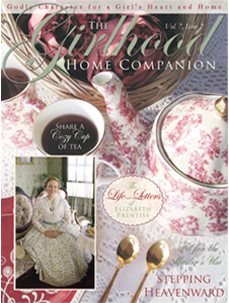 The April Mother~Daughter Tea Cozy Club features an audio interview with Lisa Steigerwalt, The Girlhood Home Companion’s resident Home Economist and Certified Etiquette Consultant. Lisa shares the benefits of establishing a weekly teatime ritual in your home. You can listen to this wonderful interview here. 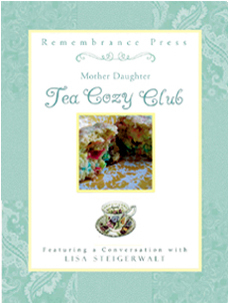 An April Tea Cozy interview with Lisa Steigerwalt. It is the beginning of a series of 12 months of The Mother~Daughter Tea Cozy Club. The rest of the booklet is available for purchase below. The Mother~Daughter Tea Cozy Club is available in single issues or a 12 month bundle. The Girlhood Home Companion is available in single issues or in beautiful back issue Treasury Albums.